I was born and raised in the Catskill Mountains of New York State. In 1960, as a freshman in Margaretville High School, my artistic talents were noticed by an observant art teacher, Burt Van Scoy. Through this nurturing, I was encouraged to attend Alfred State University College of Ceramics and graduated with a BFA in 1968. This was in the midst of the hippie era and the anti-Vietnam war demonstrations; and as unlikely as it was, I got interested in the military. While in college I attended ROTC and obtained my officer’s commission, and upon graduation served in the military for two years. After an honorary discharge, I moved to Detroit, Michigan and was employed at The Edison Institute (Greenfield Village and the Henry Ford Museum). Working at the institute was a very rewarding experience of training others in the business of ceramics, specifically production of early American Pottery from the 1700’s through the early 1900’s. 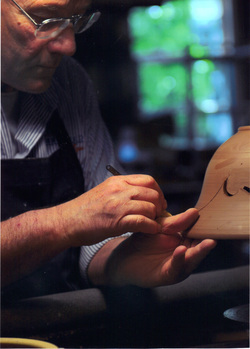 For over 38 years I worked as a master potter and performed supervisory work in other craft areas at the institute. Just prior to retiring from The Edison Institute, I was hired at Adrian College in Dec. of 2008 as Kiln Coordinator. In Jan. 2009 I began teaching Sculpture and Ceramics classes for the art department. exhibited in numerous shows and galleries nationally as well as internationally exhibited and demonstrated in South Korea. An article about Greenfield Village and my work there was featured in the May 2003 issue of Ceramics Monthly Magazine. Some of the most important pieces that are in my repertoire of functional wares would be fruit bowls, yard flower pots, bird baths, puzzle jugs, face vessels, ring bottles, and dinnerware sets. In 2010 the construction of my pottery studio began, igniting a new interest in works that are less functional, more contemporary and aesthetically appealing. I try to change the appearance of my line of work on a regular basis so it stays interesting, fresh, and relevant to those that have become patrons. Teaching has also renewed my interest in working in other sculptural mediums again, such as wood, concrete, stone, and metal. With a lifetime spent in this line of work, it has never grown boring, nor have I lost interest in producing for those who love art and the handmade. I want to be able to work until my last day on this earth, creating pottery and sculpture as my lasting legacy.